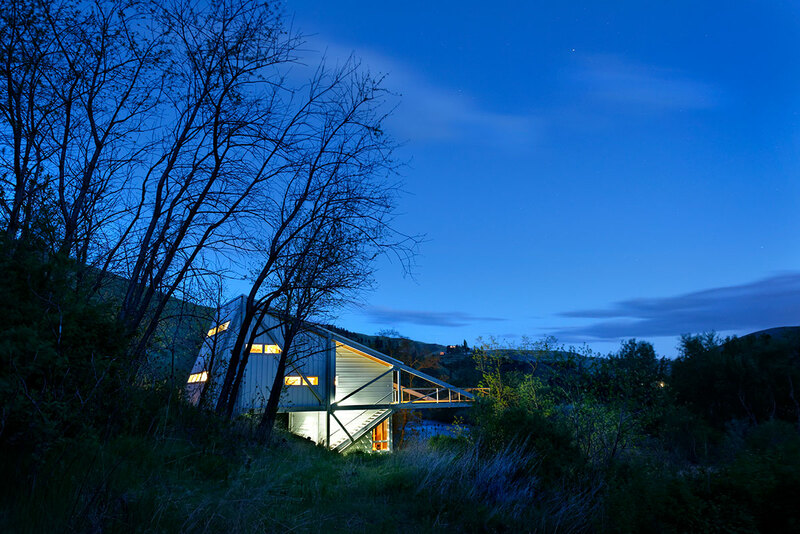 At the end of an existing single lane, unpaved road cut into a hillside near Juliaetta, Idaho, our clients wanted to create a live-work space for their winery and vineyard, preserving the ideal exposure and soil for grape production. 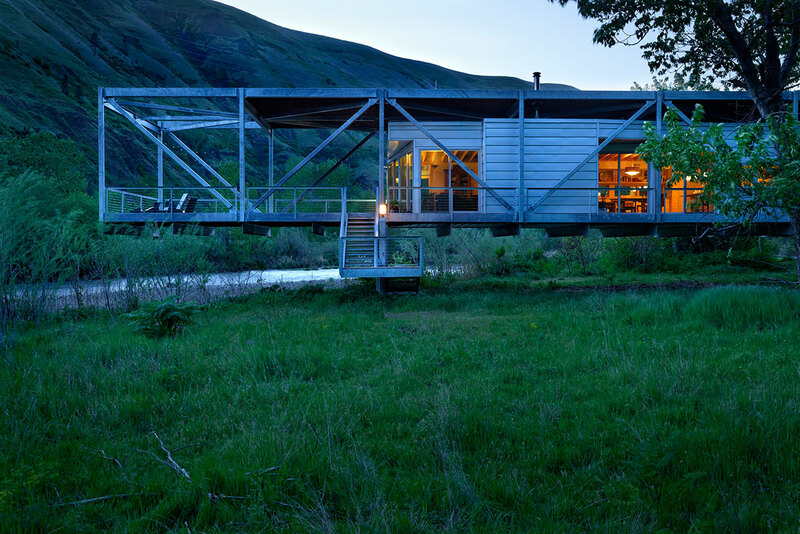 To accomplish this, we located two structures – one above a flood plain – called “the Bridge,” the other perched on a narrow basalt cliff overlooking a spawning pool on the Potlatch River –called “the Lookout.” Owner and guest quarters are housed in the Bridge structure where multiple uses (additional guest facilities, a small event space, storage, and studio) are housed in the Lookout structure. The site challenges included summer temperatures reaching 110+degrees F, a healthy population of rattlesnakes and bull snakes, periodic river flooding (the flood plain site flooded twice during construction), and limited access to construction equipment. 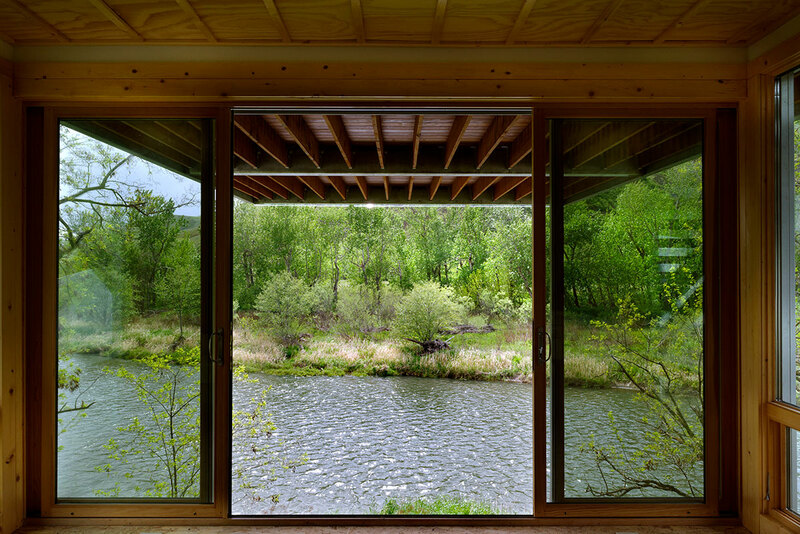 Additionally, the clients requested close proximity to the river and minimization of energy consumption and site disturbance. The building forms were derived from these circumstances. The Bridge (living-guest quarters) is set approximately 12 feet above grade and minimizes ground disturbance by being supported on only four 8-inch thick concrete piers. The floor elevation was determined by hydrologist water shed analysis and is set above the 300-500 year flood event elevation. This ground separation also discouraged snake infestations. A 15-foot deep steel Howe truss system spans 80 feet at the center span with 32/16 foot balancing cantilevers at each end. The longer cantilever extends over the river while the other continues to a gangway that leads to the parking area. The steel bridge truss supports a wood lattice that shades conditioned space below and reduces calculated cooling loads by 20%. 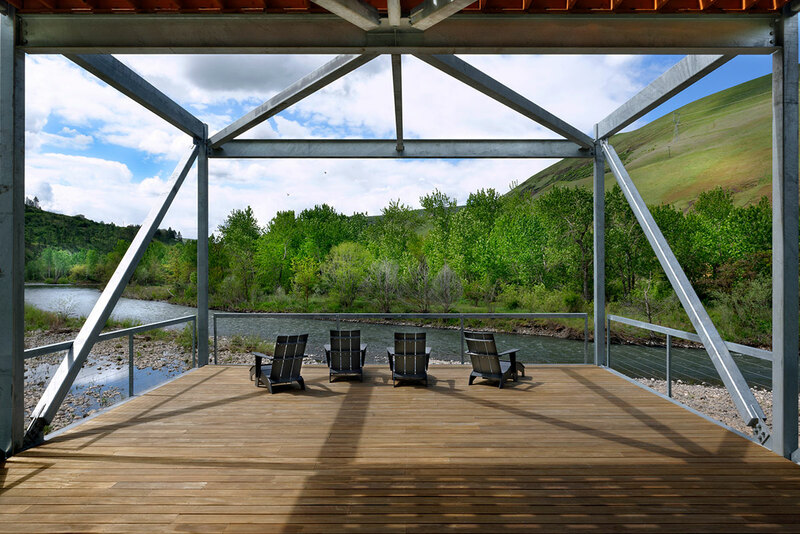 The precise shape and location of the structure were made to weave into an existing cottonwood grove. The Lookout (multi-use space) is roughly 1000 feet up river from the main structure and is constructed with an inverted steel truss exoskeleton cantilevering 40 feet over the river. This was needed to meet the river setback requirements and space for viewing a rare Steelhead spawning pool below. Interiors of both structures are tough and utilitarian, clear finished local pine, exposed framing lumber, with standard plywood sheathing. The lookout space uses sealed OSB flooring. 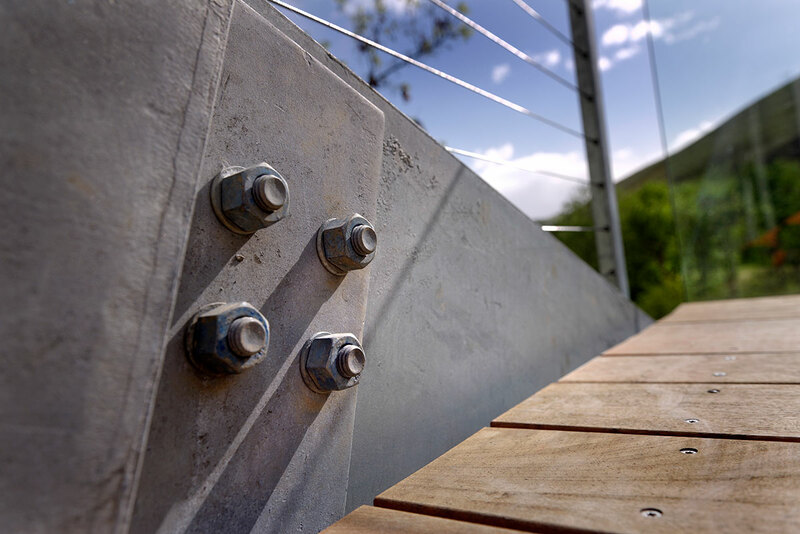 Exterior finishes are Galvalume metal siding, galvanized steel, and oiled Garapa wood decking. Because both structures have essentially “scaffolding” as a part of their design, construction costs were kept to a minimum at $118 per square foot for the bridge structure and $147 per square foot for the lookout.